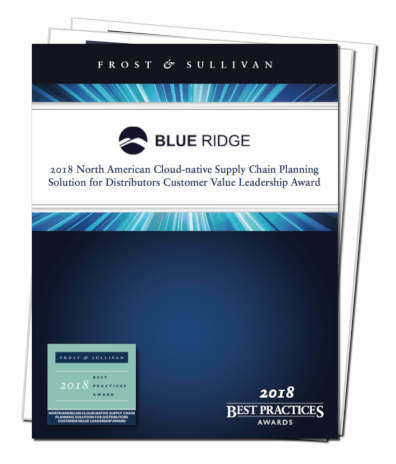 How are Blue Ridge Customers Leveraging Cloud-Native Supply Chain Planning? The wholesale distribution landscape is a complex and demanding market to compete in. Whether you’re an automotive distributor or a foodservice distributor, your customers strive for superior service, fewer backorders and less overstock. To meet the needs of customers, wholesale distributors need a supply chain planning solution with a comprehensive consumer forecasting model to anticipate and plan for changes in customer demand. Customer Impact and Business Impact – Blue Ridge’s enterprise-class capability with app simplicity allows clients to focus on growing their business rather than managing complex processes. Within Blue Ridge’s integrated application, the forecast considers additional market factors so that the system can provide a comprehensive forecast view with the precision superior to other solutions. Customer Service Experience – Blue Ridge customers are up and running faster than most in the industry. Within 90 days of signing a subscription, companies are live and have complete initial SCP training. Once live, the Blue Ridge LifeLine Service team steps in to proactively monitor the customer’s planning activities and provide guidance and solutions on issues that arise. Customer Acquisition and Growth Potential - Boasting high customer satisfaction, one of the highest customer retention rates in the industry (98.0%), and a robust and continuously expanding customer base (a 120% increase in bookings driven by net new customer acquisition), Blue Ridge continues to strengthen its position year over year. SALES ARE BOOMING. NOW I'VE REALLY GOT PROBLEM.